We ordered the antique white. Love the color and style of the nightstand. Material seems to be really nice and sturdy quality. Comes fully assembled. Has a charging station built in. Love it! 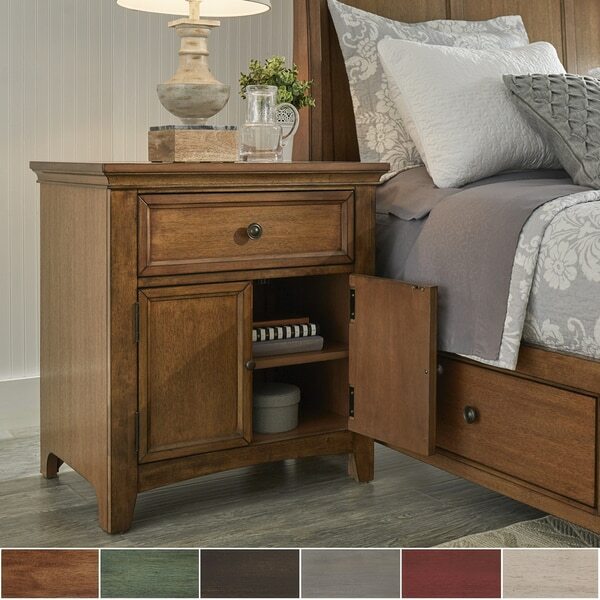 Add a sense of classic style to your bedroom with this beautiful and functional Ediline nightstand by iNSPIRE Q® Classic. The attractive, transitional design will match almost any home decor. Easily customize this piece by choosing from multiple colors including oak, antique sage green, berry red, black, antique white, and antique grey. Featuring one large drawer and a spacious cabinet with a center shelf, you'll have plenty of organized storage room. The drawer features two standard electric outlets and two USB ports, so you can conveniently charge your electronics. Update your bedroom or guestroom with this beautiful and useful nightstand. Looking for bedside tables with a hidden power station, I decided on these. I Got the antique white. 2 of them. Super quality. Heavy duty, but not bulky. Love the power strip, it comes in handy for sure! Very roomy and so very functional. I absolutely love them. My daughter just loves the color. They can add a rustic or cottage or coastal or country feel to any room. You can see the quality in the dove tail drawers, smell the wood quality and feel...What a Great buy! OH....! And one the best things about this table is...IT COMES FULLY ASSEMBLED!!! First of all definitely look at the measurements before you order because it is a lot bigger than it looks but that worked out perfectly for me. This replace the small dresser and nightstand that I had previously. Tons of drawer space and cupboard space and it is gorgeous. Definitely heirloom quality and comes completely built. I actually had an issue with the charging port that stoped working after A few days and i massaged customer service to you see what could be done. They not only sent me a new charger but a whole new drawer so that I just had to replace the drawer and not worry about messing with the actual electrical portion. Great item and amazing customer service. This is a beautifully made cabinet with nice gliding top drawer, and HUGE capacity lower cabinet with shelf inside. Top drawer is lined and has two USB slots and two plug in power ports. Just what I was looking for at an affordable price! The nightstand is beautiful! I got the sage green and I just love the color of the wood. It came fully assembled and well packaged. The drawer opens and closes well, and I like the charging feature in the top drawer. It's a little larger than I expected, but that's my fault for not looking at the dimensions more closely. Excellent purchase! i bought a pair of these nightstands to go next to an Ethan Allen sleigh bed. These nightstands are made of a HEAVY wood construct. They are extremely solid and well made. The top drawer has a felt lining and there is an outlet in the back of the drawer that has a standard plug and 2 slots for standard usb charging cords. The doors are solid wood and close tightly. I am usually very critical but this piece of furniture is excellent and i give it a 5/5. Never made a big purchase like this online. Love this item as well as the bed and other style nightstand. Excellent service and shipped/delivered promptly. Will definitely recommend to all my friends. I bought two of these nightstands. They were delivered quickly and the packaging was first rate. The materials produce a nice wood appearance and the cabinet is well constructed. One of the nightstands has a slightly damaged rear corner but it's no big deal. But that's why I only gave 4 stars. We could not be more pleased! SUPER quality, very sturdy, and the USB plugins in the back of the drawer just couldn’t be more convenient for our Apple Watches and iPhones!! SO glad we bought these!!! I am not impressed at all with the quality of this nightstand. I purchased two nightstands and the bed. Spilled some coffee on the nightstand and it affected the finish on the top of it. Yes my fault for the spill but I wouldn't think that it would affect the finish in 1 hour. No one was home and they were to deliver inside home. The next delivery is tomorrow will the packing cartons be taken away also? Love the color & size. Going with the entire bedroom set and will be very happy!!! Packaged well and arrived quickly without any damage. Highly recommend. The drawer doesn't close perfectly, and the clasp to close the cubbard was off set, so it needs a minor repair to work. All in all, I like the look of it and am generally pleased. I was impressed with the trim details. We are using it in a office bathroom to hold a tiffany style lamp, paper towles & a tall arrangment of simple greenery. It is beautiful and we are now going to order another one for the other ladies room. Millie P.
The nighstand itself is a nice purchase. Beware it’s very heavy. My star rating in more on Overstock’s customer service. Again, I received one of 2 nighstands damaged and they don have a replacement. I was given 2 insulting compensation offers to which I couldn’t accept. Shipping it back would be more than I was offered. These night stands are very nice, quality wood, and well made. Love the lined drawer with the plugs inside so I can charge my phone and ipad. The drawer slides smoothly too. Happy with this purchase. Lovely, well packed and well made. We could not be happier. Plan to add 5 drawer dresser if they go on sale soon. The extra shelves instead of drawers. Plus the charging station was perfect. "Am I able to remove the shelf inside of the doors? I need room for something that is 9" tall. Thank you!" The shelf comes attached and can not be removed.